If you didn’t update to Finale 25, Monday is when you want to do it. 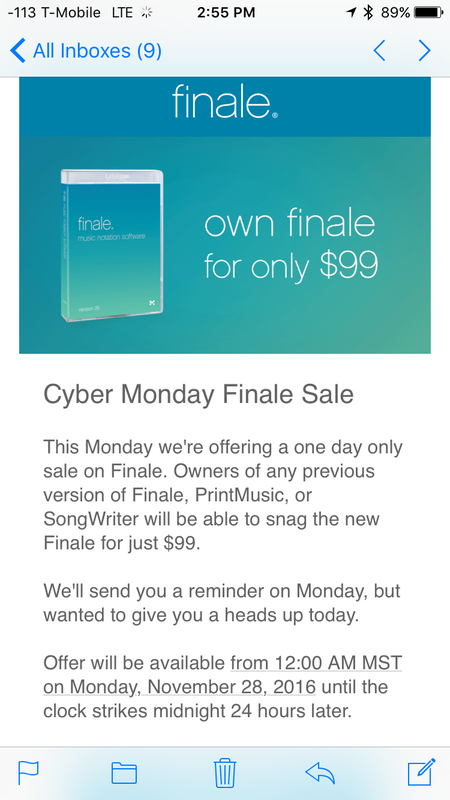 MakeMusic is offering a $99 upgrade to existing owners (of Finale, PrintMusic, and SongWriter). Finale 25 doesn’t operate any differently than previous versions–most of the work was done “under the hood” updating the code. While there are some “new” things (e.g. transposing parts) the 64 bit programming is why you want the latest version. Hopefully you saved some cash to be able to take advantage of the sale. You can file this in the category of things that I never considered: Alfred Music is now a part of the Peaksware family. Nearly two years ago, MakeMusic went private and was acquired by Peaksware. Since that acquisition, a lot of good things have occurred at MakeMusic: regular updates to SmartMusic, a much more stable system this academic year, an expanding catalog, the acquisition of Weezic, the export of MusicXML to the W3C committee, an upcoming new version of Finale, and a truly “new” version of SmartMusic based on the Weezic acquisition with an entirely new pricing scheme. I don’t know how Alfred’s new “sibling” relationship with MakeMusic will play out, but I am hoping that the future-minded aspects of MakeMusic will have an effect on the publishing side of Alfred. It should be noted that Hal Leonard owns Noteflight, and now their Hal Leonard’s largest competitor, Alfred, is a sister company to MakeMusic. I’m excited for the changes in this industry in the coming year(s)! In May of 2011, I had a rather direct conversation with a VP of MakeMusic about the iPad. At the time, the iPad was relatively new (the iPad 2 had just been released), and I was arguing for SmartMusic on the iPad. At several music conferences that year, MakeMusic representatives had discussed (with me) whether it made sense to have a web-based SmartMusic platform, or to go device specific. In the end, MakeMusic chose the iPad, and it didn’t choose wrong. The iPad is a wonderful platform for SmartMusic, and thousands of students are using SmartMusic on their iPads. But none of us expected the impact of the Chromebook in education. As you can see from various posts on my blog, if you have a choice, the Chromebook is the wrong device for music education. Chromebooks are the result when a district chooses the device, or a music teacher can’t afford iPads (With all sincerity, a MacBook or Windows computer is a better option for music than a Chromebook). This doesn’t mean I am anti-Chromebook, but we have to be honest and admit that they are not the best device for music. That hasn’t stopped thousands of schools from adopting Chromebook 1:1. If every student has a Chromebook, what do you do about SmartMusic? Nothing. You either have to have students with access to Mac/Windows/iPad, or they can’t use it. Meanwhile, a number of other players have entered the field of green note/red note programs. One of those programs, which won an award at NAMM this past January was Weezic. Weezic is a French company which has offered green note/red note feedback, provided a library that sold songs individually, gave users the ability to purchase a song to be put into Weezic’s format, and recently was moving towards letting users upload their own MusicXML files, as well as audio and video files that–using Weezic’s proprietary algorithms–would sync the visual music created by the MusicXML file to the uploaded audio and video. Furthermore, Weezic was promising to have a conservatory feature (school mode). The crowning achievement (if this wasn’t already enough)? The latest version of Weezic, although already an iOS app, was running on ALL platforms with HTML 5. Had Weezic come out this fall, MakeMusic would have had a lot of competition for SmartMusic (along with new multi-platform solution, PracticeFirst). Although I have been aware of Weezic for a long time, it was not a solution for me as it didn’t have the literature I needed, and I didn’t want to pay someone else to convert literature for me. However, as Weezic announced new features early this winter (allowing you to bring your own materials into Weezic), I made sure to visit their booth in February at TMEA, and saw most of these features in action. I felt, at the time, that Weezic had the best chance to be a SmartMusic competitor, particularly if it was priced right. However, after building up a lot of steam in February, the company had gone quiet, and today’s news explains why. The news from SmartMusic today is that they have acquired Weezic, and it just makes sense. In doing so, they eliminate a competitor while incorporating their technology, meaning that we will see a platform-agnostic version of SmartMusic sooner than later. Earlier this year (before today’s news), an reliable source told me that MakeMusic would be (at least) several years away from releasing a web-based version of SmartMusic. I wouldn’t expect to see a web-based version of SmartMusic any time soon (think fall of 2016, perhaps), but MakeMusic now has the technology in hand to make this happen. This is a great acquisition–the best I have seen from the company since it brought Michael Good on the staff; and in fact, it is the first “major” good public news in a long time. It shows that MakeMusic was able to assess the market (i.e. Chromebooks), realize they couldn’t react to the market while continuing to develop and support their existing products, so they acquired Weezic for their staff and technology. Unless the web version is a “knockout,” I would expect to see continued development of the Mac/Windows/iPad versions, although a web-only product could be an end goal for the company. Do you remember how long it took for the iPad version to come out? Expect a similar length of time for a web-based SmartMusic, and perhaps a product that slowly adds functionality (just as the iPad version did). MakeMusic is also opening an office in Europe, which is a good sign for the future of MakeMusic as it attempts to make a stronger effort in the European market (a place where Sibelius has reigned supreme). The only negative part about this acquisition is that some Weezic users will lose access to the songs they have been using (and perhaps purchased). It would be nice if all of Weezic’s library could be rolled into the new SmartMusic (whenever that comes) for those users in particular. I would also like to see Weezic’s ability to connect audio and video to a MusicXML file brought to SmartMusic. In closing, this is great news for MakeMusic, and it will be exciting to see the changes in SmartMusic as a result of this accession. Two weeks ago, following my visit to the Illinois Music Education Conference, I was shocked to see that MakeMusic did not have a booth in the vendor area, even though they did have a presentation at the conference. I was already concerned about the company after its move to Colorado and loss of 100 employees during the move, as well as the major changes in company leadership down to manager levels over the past two years (with some positions having changed twice in that time period). As I am likely to do, I wrote a blog post about my concerns. There is no denying that a lot of former MakeMusic employees are no longer with the company; however, the people put into leadership positions (particularly at the product level) have been with the company for many years and are familiar (experts) with the product. The decision to attend or not attend various conventions with a booth is a result of foot traffice from past conventions. Even if MakeMusic is not providing a booth, they are often sponsoring clinics with paid clinicians and sponsoring other events (such as the TI:ME rooms at OMEA). There are MakeMusic employees who are advocating for participation at as many events as possible. They want to make it clear that Peaksware, the “mother company” of MakeMusic, is NOT a health fitness company, but a health training company. They feel the skill set of health training (discipline, focus, and committment) lends itself nicely to the world of music education. While SmartMusic continues to be important in the company and a huge arena for growth, they want people to know that Finale has NOT been forgotten or left behind. One employee wished to communicate that MakeMusic, before going private, was in a tough position as decisions were often made to please share holders and to increase stock value rather than to do what was always best for the product. This person wanted to communicate that the clear direction of the company and its finally “settled” focus have led to a better company, even with all the changes the company has endured over the last months. There was sadness expressed at the loss of colleagues, but an understanding that the show must go on. I certainly hold no ill will towards MakeMusic, but I still find myself sad that the company is no longer in Minnesota, and I am sad for the many former MakeMusic employees that loved that company and either were not asked to go or could not move to Colorado. That said, if you did not know anyone at MakeMusic and you were a Finale or SmartMusic user, you would have never known about the changes at the company, as Finale 2014 continued development with an update, and SmartMusic kept working without a hitch this fall. My position, as an outsider, remains the same as my last post: the company has gone through a lot of changes, and other companies have struggled under similar situations. I think it is fair to be on the outside and to worry. I have been told that there is nothing to worry about. My hope is that the company will flourish (they reassure me that the company has already weathered all of the changes) and that we will see exciting new products, features, and pricing as this school year draws to a close. Hopefully, you are aware that MakeMusic, the company that makes Finale and SmartMusic, has undergone a lot of changes in the past two years. In early 2013, the company was a public company, and quarterly financial results were troublesome. Karen van Lith was removed as CEO in 2012, and Karen VanDerBosch was made CEO (full time in 2013). During 2013, MakeMusic came to agreement with a group of investors, and the company went private. At that point, most middle level managers and VPs were let go (including project managers for Finale and SmartMusic). One ray of hope is that Michael Good, creator of the MusicXML file format, was brought on as a VP. This past summer, MakeMusic announced that it would close operations in Minnesota, putting MakeMusic under the leadership of Gear Fisher, CEO of Peaksware, a health fitness company in Colorado. In the past months, the company has completed that transition, leaving only Michael Good as a continuing VP (with the removal of any remaining CEO or VP since the company went private), and once again replacing the product managers of SmartMusic and Finale. Of the 130 (or so) employees that were with MakeMusic in January of 2013–only 30 remain with the company in Colorado. Although I had strong connections with the company, I personally only know one employee still left with the company. That is a lot of internal shake-up. To MakeMusic’s credit, SmartMusic has been very stable throughout the move–although I am still a little disappointed that Mac OS Yosemite basically ended any functionality of Finale 2012 or earlier on Macs. Such drastic changes result in a company can only do one of two things–either break from the status quo, finding new directions and growing under new leadership and with new staff, or cause the company to slowly spiral down the drain. As a Finale user and a SmartMusic subscriber, I am hoping for growth and new direction, but the road is littered with the skeletons of other companies that went before and did not make it. This past weekend, I was shocked to see that MakeMusic did not have a booth in the ILMEA vendor area. I quickly checked with some friends from other states, and it appears that MakeMusic is not sponsoring booths as part of its strategy this year. They ARE sending experts to make presentations (such as “How to use the rubrics in SmartMusic” and Finale sessions). Not too long ago, AVID stopped sending staff to vendor areas–and I am still not convinced about the long-term viability of Sibelius under AVID; and it isn’t unfair to wonder about the viability of MakeMusic under Peaksware. Part of my issue with the lack of a vendor booth is that the vendor area used to be the most valuable location of a conference for me. Not only was it a place for networking, but it was also a place to see the latest and greatest in every aspect of music education–including technology. If all the major players in technology for music education “pull” their display booths–that is no longer true. Vendor booths are incredibly expensive. You have to create and ship a display, pay a team of (at least) two representatives to be there, and you have to pay dearly for that space–which helps the state MEA pay for its use of the facilities where they hold their events. Any internet and power needs are additional costs. I don’t know the exact costs, but with everything included, it may cost up to $10,000 for a company to be represented in single vendor area–and that amount 50 times over for all 50 states. That is $500,000 a year! Eliminating the booth, and sending “just” a presenter could easily cut $8500 from that per-state budget, resulting in an overall cost of $75,000 per year (probably less). Even if MakeMusic is planning on sending a booth to certain states and not others–I don’t like the message that sends, even if economics are in play. I fully understand why a company like MakeMusic, which has not been overly profitable (and now that it is private–we will not see any financial reports) would need to cut its operating costs. At the same time, if a teacher cannot make it to the prescheduled sessions at a conference (many schools only allow for one day of training), they are out of luck if they want to talk to someone in person or to try something at the booth. I still feel that personal relationships are key, even when choosing technology for your program. My former SmartMusic sales representatives were very important players in the process. I want to express that I’m sad to see the vendor booth for MakeMusic disappear, and I am hoping this is a temporary cutback rather than a permanent change–and I hope it isn’t another signal that MakeMusic is at risk of going down the drain. Even though it is early in the game, we need to see signs of the phoenix from MakeMusic–because all that has been communicated (or demonstrated) in the recent past is continued cutbacks from the company.